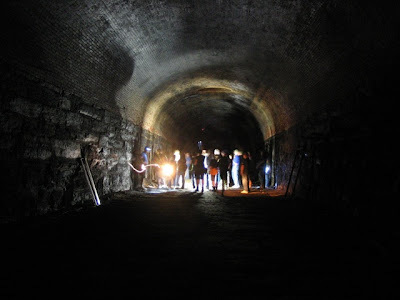 Open House New York and the Brooklyn Historic Railway Association will offer special guided tours of the world's oldest subway tunnel, built in 1844 and constructed in seven months using only hand tools and primitive equipment. Bob Diamond, who rediscovered the tunnel in 1980 will lead two tours through the half-mile long underground space. Entry is through a manhole cover (!) at Atlantic Avenue and Court St. It's an experience you won't forget. Tours conclude with a Happy Hour at the Brazen Head, with complimentary Checker Cab Blonde Ale from the Chelsea Brewing Company. To buy tickets and for additional information, click here. Maybe She's Related to Me? Gotta Go Ukraine! People Get Ready -- Totonno's is Back!